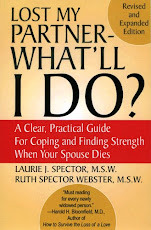 LOST MY PARTNER blog: reluctant to visit the gravesite? Have you found yourself reluctant to visit your late spouse/partner’s grave since the funeral? If so, do you find you just can’t bring yourself to go? Even when family and friends offer to accompany you? Is there guilt because this ritual is one a widowed partner is "supposed to observe"? Actually, there are no rules about this. Although some faiths mark the end of the first year of mourning by observing a memorial for the deceased, visiting the gravesite is otherwise a very personal choice. While some people find regular visits comforting, others find it too upsetting and choose not to visit. Some visit only on special occasions or holidays. As with all other aspects of mourning, you should trust your own sense of what feels right for you. My husband was cremated and his ashes scattered at sea, so "visiting" him is not an option, but not something I would be inclined to do. I have made my own rituals and memorials which included planting a tree and installing a plaque in his memory. It is in the town where we lived and I do go there from time to time. I also have done some things in the house, including a collage of his life. The memories of my husband are in my heart and my mind-I don't need to go anywhere to "see" him or talk to him-he is with me all the time. Thanks, Deb, for reminding us that there are many meaningful ways to 'remember' a loved one other than visiting a gravesite. I agree it's a very personal choice. I visited Tina's (late wife) graveside once or twice per week for the fist 2 or 3 months. The first few visits were painful, then tearful, now joyful as time progressed. Now about every other week since she passed 5 months ago. I made it a point to visit on her would-be birthday-placed flowers and read a letter I wrote to her. I drive past the graveyard occasionally and just give her a shout out- "Hi Honey". Sometimes I drive past and forget to even notice? I don't talk down to the grave when I visit. I talk up towards the sky. We always appreciate hearing from you! Your experiences demonstrate how one's feelings and perspective can change with time. Thanks for another of your wonderfully insightful comments. I started going the day after the funeral, and I continue to go, 1st thing in the morning, I get up at 6, Get there at 7 or earlier when the gates are open. Just me, her, the geese and sometimes the deer. I have done so almost every day for the last 1030 days since she passed. The only times I don't go is when I'm away, or the weather (snow) doesn't cooporate, or on Saturdays, because she was Jewish and the cemetery isn't open on that day. She is 3.7 miles away, so it isn't a long trip. It has been nearly a month since my husband's death. He had a terminal lung disease and had been slowly going down. I visited the grave today no headstone . There will be one in about six weeks placed for both of us. Someone had placed a red white and blue pin wheel there.Wonder who? It was hard. I have only been by twice, today was the first time I got out of the car.